One of the newest teams to join the Major League Soccer (MLS), Atlanta United FC is a soccer club in the league’s Eastern Conference. They began playing as an MLS expansion team in 2017 and won the league’s 2018 cup. Their home ground is the Mercedes-Benz Stadium, which they share with the American football team the Atlanta Falcons. Their head coach was Gerado “Tata” Martino, former coach of Spanish giants FC Barcelona, but now the post is vacant. Let’s take a look at this rising MLS team. Founded in 2014 as an expansion to the MLS in 2017, the club is owned by Arthur Blank, the co-founder of Home Depot. Atlanta United FC is a very new team in the MLS, only joining it in 2017. Based on 2018 regular season attendance, Atlanta United FC has amassed the largest fan base in the MLS. Also, they’re the most valuable team in the league, with Forbes estimating their value at $300 million. Nicknamed “The Five Stripes”, Atlanta United FC’s colors are red, black, and a bit of gold. Their away uniform is white with red stripes. In the Eastern Conference and Supporters Shield matches, they came second. As mentioned earlier, Atlanta United FC managed to win the MLS championship within two seasons. They beat New York City FC, New York Red Bulls, and the Portland Timbers in the final. The win has qualified Atlanta United FC for the 2019 Confederation of North, Central American and Caribbean Association Football (CONCACAF) Champions League. 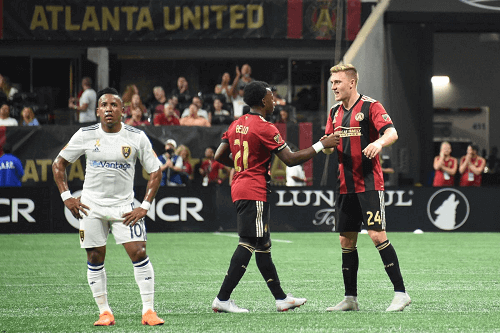 Atlanta United FC burst into the limelight, and their early victories shocked everyone – it took them only two seasons to win the trophy for the biggest league in North America. They’ve also quickly amassed a dedicated fanbase, filling up their home stadium. Therefore, this makes them the ones to watch in the upcoming MLS season. Let’s hope they can maintain their strong form and pull another triumph again.